This post provides an introduction to the 3-card Tarot variation, the centerpost of this World Servers' Spread. The Three-card reading is one of the most simple and yet most subtle tools in the Tarot reader's arsenal of spreads. 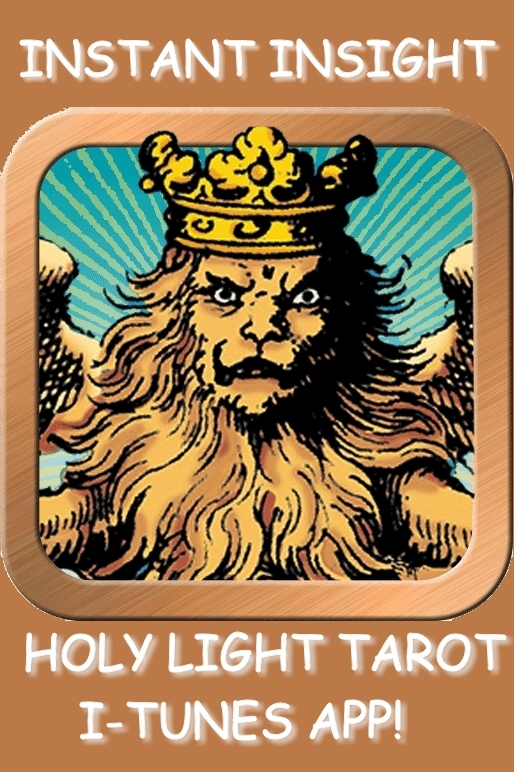 Because it can be adjusted to highlight a number of concerns inside a very tight scope (the steps of 1-2-3), a creative Tarot user can virtually carry on for an entire career using only this spread and its multiples. For the 3 card variation of our World Servers' Spread, let's look first at the sequence 1-2-3. One way to look at this is to use the ancient titles for these things; Monad, Dyad, Triad. *singleton, polarity, fulcrum (in the sense of dividing the question by one, then two, then three). *In geometrical terms, this means Point, Line, Plane, and defines the close-in nested dimensions that emanate from or converge upon the One. *In terms of consciousness this means Self, Other, and Relationship or Communication. *In terms of the causality, this means Action, Reaction, Result. Already we see the beginnings of a method for employing this kind of tri-fold analysis to study an event, situation, or experience in our lives. Now let's look at some of the traditional variations on the "classic" three-card spread. One very popular approach is to pick one card each for the Past, the Present , and the Future. We can see how this approach combined with the 1-2-3 inner structure suggests that as time unfolds from the past into the future, it takes on increasing complexity and multiplies the potentials for realization. Another oft-seen arrangement that comes easily to mind echos one of the categories I mentioned above -- Self, Other, and Relationship. Again one can see how the increasing complexity of the 1-2-3 sequence gets expressed, but this time from the point of view of the ego. The Self card represents the internal universe of the questioner, separate and distinct from all other selves. The Other, however, introduces an alien force into the Self's reality, which changes the information-stream completely and introduces difference-value into the Self's world. Finally the Communication (or Relationship, or "we" card) demonstrates whatever common ground there is upon which the overlap of these two different selves can stabilize. The three-card spread that is used at tarot.com is actually the opening movements of the larger Celtic spread. This gives the three positions as Self, Situation, and Challenge. For many people this makes a perfect snapshot of the Self in context, and even just this much current insight can be tremendously liberating to see portrayed objectively in the cards. This is the spread that is shared for free at tarot.com, and I will never tire of saying that a savvy Tarot user who knows how to ask nice, tight questions can get a lot of free mileage out of that feature. I want to support my students in applying the Tarot to macro-issues on a societal, cultural, and global scale, rather than only using it exclusively as a micro-tool for individual, private issues. Therefore I will suggest another approach to a three-card spread based on a "great mystery" hidden in the Trump pattern. 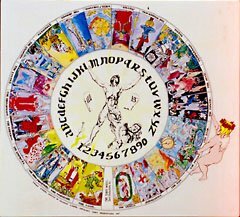 Some of you might have already been exposed to the idea that the Trump sequence can be visualized as a circle rather than just a straight line running from the Magus to the World (or the Fool, depending on your deck). 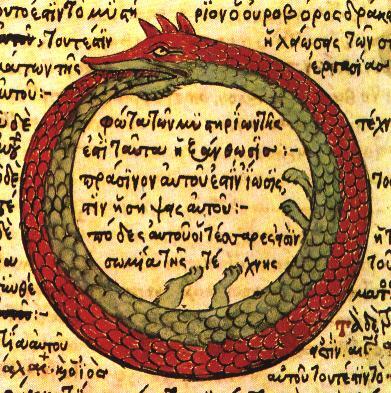 When the beginning and the end of the sequence are bent towards each other like the ancient symbol of the snake eating its own tail, we see the first and last cards inter locking in a way that is not enough emphasized. 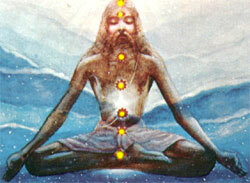 Controversies over where to place the Fool card only serve to further bury this convergence-point in confusion. The way I link the first to the last cards is influenced by my background in Continental Esoteric Tarot. This is the method it pleases me to use, and you can use it too if it makes sense to you. 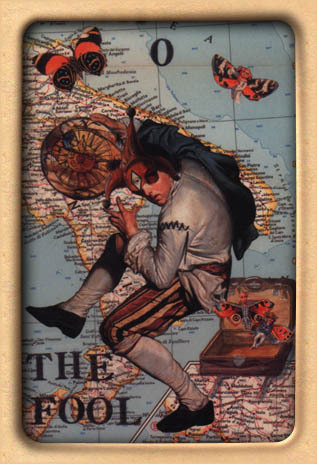 Envisioning the Trumps as progressing from the Magus clockwise in a circle, and keeping the Trumps in Marseilles order, we will see the World wrapping around, through the Fool, to return to the Magus again. 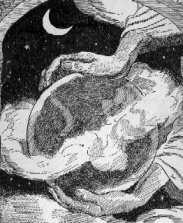 The Fool becomes the "middle term" between the World and the Magus, serving as hinge, lock, or glue to bind the sequence into a circle. But in what order are the cards to be placed, then, in order to make best use of the 1-2-3 sequence in which every group of cards is laid out, no matter what the spread? This turns out to be a philosophical point, much like the decision one has to make to use the inward-directed three-card spread above (which details the belly/heart/head triad). In my own mind, I see the World as the Monad, the Fool as the Dyad and the Magus as the Tetrad. 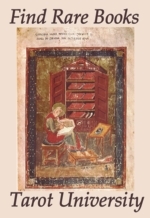 In the imagery and teachings of the Number Theologians (like the Pythagoreans), the World is the Monad, the BIG ALL from which all forms and categories of beings are drawn. So this position is filled first, followed by the Fool spot (to the right). The Magus position in this spread represents the awakening individual self, rising to a new level of relationship with the larger creation, and sending forth healing energies from the individual psyche to be shared with the rest of reality. Just how does this spread work in practice, then? Let's pull some cards and see... It really doesn't matter what Tarot deck gets used, since I don't read from the pictures as much as I do from the numbers, suits, ranks, and titles. But for your information, in this case I have been shuffling the Golden Tarot by Kat Black. My question is "How can the readers of this Tarot ArkLetter relate themselves to the World in such a way that they can make a positive contribution to the problems of stress, environmental degradation, instability and fear that we all feel and see around us?" 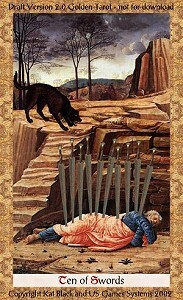 The card that emerged here is the Ten of Swords. From my essay on the Minor Arcana in Tarot ArkLetter Number 3, you can see that this card traditionally indicates "terminus", as in endings, deaths, collapse of an enterprise, or fatal hostilities. Having this card show up in this spot gives a somewhat ominous opening to our spread, because it seems to suggest that the World, Gaia, our Great Mother is suffering through a harsh transition that might be so extensive as to change terrestrial life as we currently know it. Perhaps it's the heat and drought that seems so extreme in the Northern latitudes this summer. Certainly there's the incredible floods in Mumbai and its surrounds, representing the highest concentration of rain in 24 hours that any region in India has suffered since records began to be kept 150 years ago. The fearfully-projected Asian Bird Flu epidemic (expected by viroligists around the world, possibly as early as this winter) could be part of the picture here. And of course there's the routine poisoning of every human, animal and plant in the ecosphere by industry, excreted prescription drugs, power plants and vehicle exhaust.... In short, unsavory as this card appears in this position, it's clearly making a pointed statement about how crucial it is that the situation at hand be addressed, and quickly, before our loss of species, critical habitat, clean water, fertile farmlands, coastlines and even the weather pattern itself becomes irreversible. This card came up the Knight of Wands, and his job here is to simply ~embark~ upon the path of change, ready or not. 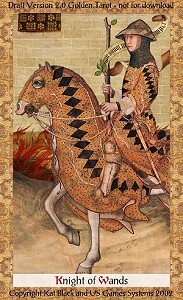 This Knight carries the Spring energy of the Wands (the fire signs), so his traditional role is to start things, whether it is a new project or a forest fire. Since the #2 position specializes in raising contrast, becoming aware of difference-value, and highlighting polarities, we will look for the trend of change that this Knight can introduce, hopefully to restore, revive or revise the energy of the Ten of Swords in the previous position. My inclination is to see this Knight as a bearer of enthusiasm and optimism, who can ride into problem areas with a can-do spirit, fresh inspiration and as-yet-unspent resources. He might or might not arrive as a hero and role model (there's always a chance he'll be a Trojan horse! ), but in any case he brings new approaches to bear on what is clearly a troublesome set of givens. I hope this card is hinting that the new environmental technologies that our President recently announced with his Asia-Pacific climate-change pact can be produced and brought online soon enough and energetically enough to make a difference on the dismal direction our global environment is devolving. This card is another ten, this time the Ten of Wands. Of the three cards in this spread, this is the only one which has presented itself reversed, or upside-down. Clearly the individual soul is placed under an extra burden during times of general stress and breakdown. Not only does one have to deal with the usual tensions of individuation, socialization, and family survival, but then on top of those are added the general malaise of mass abnormalcy and disruption. Issues of self-protection and survival become more acute when the ecosystem around one suffers stress. 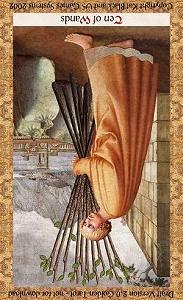 This card is the last term in a sequence that is athletically and willfully rigorous in most of its stages (by this I mean the 1-10 of Wands). Therefore this 10 will often have a feeling of great relief and exhaustion about it, as if representing the runner's grateful collapse at the end of race, or the final clank of the drawbridge closing just as the enemy's troops clatter into sight. I often find myself saying "just in the nick of time" about the way this card manifests, and I hope this principle is applicable in this reading as well! The reversal suggests that there will probably still be painful losses, that the risks might nearly balance the gains, and there's a good chance the heroic individuals who serve on the front lines of this struggle will have their individual dreams and goals sacrificed for the greater good. Let's give our powerful little spread a name, and call it the "World Servers' Spread". Feel free to use it whenever there's a need to make a bridge between the indescribably large forces around you (the World) and the private universe you personally live in (the Magus). Consider the card that falls into the Fool position as a kind of "wild card", in that it has the catalytic power to scale communications from the Macro situation to the Micro situation and back. The #2 card also carries within it the surprise-quotient of felicitous accident, reconciliation of opposites, and figure/ground inversions. Together the three positions in this spread detail how the World is reaching out to humanity, calling us to awaken to the evolutionary crisis that all creatures are facing at this collective moment. In return humanity can be reaching out to The World as well, braving the void of the unknown and trusting the process, even in the presence of great fear and uncertainty. Let us pray that by leaving the Fool space open to the emerging "AHA! ", both the World and Humanity can be led, as if by the Holy Spirit, to higher ground. past = 1. i would like to comment that in a spiritual sense, the past is NOT locked or frozen as we CAN change it. what? we can change our perception of it, our attitude concerning it, and our understanding of it, and in changing that, say via "forgiveness", we ultimately then change both the present and the future. so for me it is the past that is "1", with magus being appropriate and the present that is "0", with the fool especially if i am unaware of influences. This is the beauty of Tarot, is it not? We can move the parts and pieces in relation to each other, and see meaning in all kinds of arrangements. If this is what is relevant to you, then it is a fine arrangement, no matter whether I can "see" it or not. This is what I am guessing is the third card in the triumverate, right? What this says to me is that you have your Trumps rotating in the opposite direction than I do, counterclockwise instead of clockwise. And this is totally traditional. By that I mean, some of the earliest lists of the Trumps count them down from the top (World) instead of up from the bottom (Fool), so when you make them into a circle the resulting hoop spins both ways with equal ease. I have been experimenting with "the past" and the forces which can be brought to bear to put it through changes. I agree -- by adjusting our outlook in relation to the object in question, we will adjust what we see and therefore what the object is to us. My memory retains only this piercing question from a metaphysical money tape I heard years ago, which the author repeated multiple times: "If the the mind is the seat of power, what does it behoove me to think in this instance?" I think I oriented the World Servers spread the way I did so it would start out with the World card, and do the work in a step-down fashon rather than a step-up fashon. 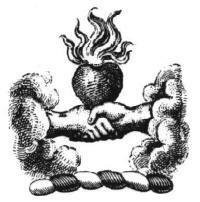 But we both put the Fool in the middle position, so there is something we are both holding in common there. He's serving kind of the like the disks that hold our vertebra apart, so they can each do their seprate jobs and not interfere with each other. The Fool is standing between the micro and the macro, taking up the slack in the moment of Now. Thanks for your variant on the spread, and I hope it serves others to note the alternate approach. Thank you, that does clarify a lot. Most especially when rethinking comes more readily than emotional rewriting. Will you be addressing this orientation question with the "tree of life"? the "0" fool is kether, and that we can go up the spiral from "ain soph aur" into "ain soph" and "ain", if i'm not being wholly presumptuous. it confuses me that 21 "the world" is both malkuth = beginning and yet some-times "reward" and culmination. so again i can only process by seeing a spiral of self-evolution?? which brings me to another most sincere THANK YOU for your lessons, and for the opportunity to participate via the "world server's". for another FLIP on the "world servers spread" i think i want to specifically ask "what can i do"? or "how am i needed to act"? then is it  NEED,  action needed & opportunity given, and  level or sphere of action? So, Christine, how do i use the "world server's spread" do be a "world server"? I mentioned the Tree of Life and it's method of proliferating itself "up" and "down" in the response I left you at the end of the Coins suit. Maybe one of these times I'll break down a Tree of Life spread for Tarot, and we can unpack those ideas some more. In my studies, I have not been happy with putting any Trumps on the stations of the Tree, because when those stations are introduced in the Sefir Yetzirah, they are given Numbers or Planets rather than letters. The letters (Trumps) then fill in the paths between the Sephiroth. This satisfies my Pythagorean side, addressing the Decave-mysticism that was part of the Alexandrian synthesis which informed the first Kabbalists as they were originally conceptualizing the Tree. You can also see this trend in the earliest sketchy drawings left in the margins of the QBL manuscripts, before the Tree model was even settled on. Whether viewed as a chain, or a spiral, or a set of nested spheres, or whatever else, the Sephiroth would as often have numbers and/or planets on them than titles, as befits their relationship to the "Spheres" of the Hermetic Cosmos. 22 is the number of the Mother Alphabet. This does not even include the ancient's calculation of 22/7 to substitute for pi when dealing with spherical calcuations (as in the Platonic Solids). So we have to have very, very flexible minds to take in the fact that the Whole is divided by X number in one set of Mysteries while being designated by Y number in a different Mystery Teaching. It's the same Reality every time, which is multiform and polymorphous perverse in it's "raw" state, but which will also show us models of tenness, twelveness, sevenness, or any other division/relationship that we can imagine, all without ever changing it's essential nature. It's like the physicists' Uncertainty Principle -- whatever you are looking at is field until you start to look ~for~ some discreet thing, at which point the field collapses and shows us the "thing" we had projected on it. So what is real, the field, or the thing? It's all in who's looking! In using the World Servers Spread to become a World Server, I think the key is to simply try and identify the principle at work, then turn around to look at your life and see where the lesson applies. One thing I have noticed in my years of doing readings, is that the same spread applies all over one's life, even if the question asked was about one particular issue or situation. In other words, a client and I will start out trying to investigate their workplace issues, but by the end they are mentioning how the very same advice would work just as well in their marriage, in training their dog, or in handling their finances. Hence, I emphasize the realm of principles, of momentum and trajectory, of Natural Laws when reading the cards. Divination and prognostication in their traditional senses don't enter in to my interpretations very much. That way I can take the lesson, however it was first detailed, and apply it to other situations which are contemporaneous with the present situation being examined. What I would say about your "flip" of the World Server's Spread is, try it the new way for awhile and see what happens. Don't just try to live out the spread I post here, but do your own and see what circumstances you are pointed towards and how the results play out in your own reality. There's nothing wrong with a spread having nothing but positions about "the question", without leaving any positions open for "the answer". Perhaps "the answer" will be found easier by allowing "the question" to be proliferated more fully through a spread with cards! Ok, now I'm not sure whether I addressed your "question"!